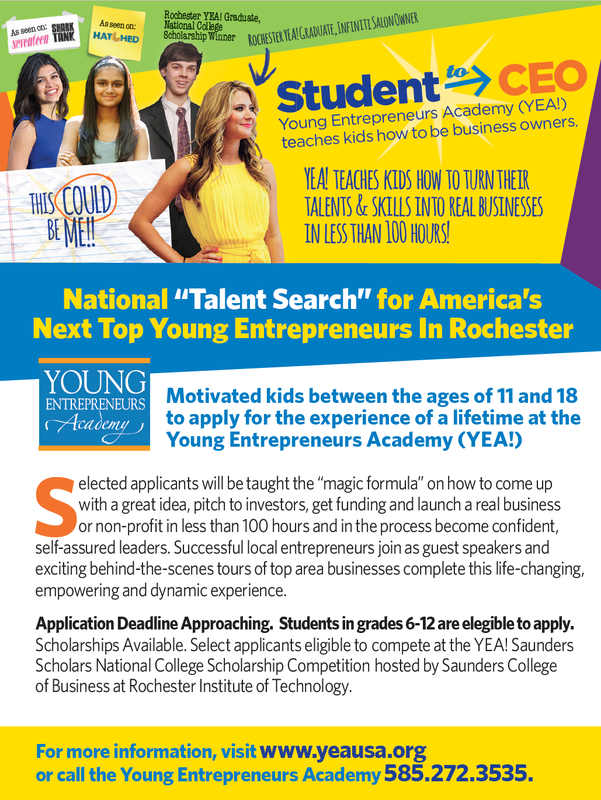 Locate Finger Lakes is proud to launch the Young Entrepreneurs Academy (YEA!) to ignite the spirit of entrepreneurship in kids across the Finger Lakes region. Locate Finger Lakes will launch two YEA! chapters in the Finger Lakes region to be held at both Cayuga Community College and Finger Lakes Community College. The “talent search” is on for America’s next top young entrepreneur right here in Finger Lakes region. Do you know a motivated kid between the ages of 11-18? Selected applicants will be taught the “magic formula” on how to come up with a great idea, pitch to investors, get real funding and launch a real business or non-profit in less than 100 hours! The Young Entrepreneurs Academy has successfully produced kids who have appeared on the hit TV show Shark Tank, featured in the New York Times, USA Today, Good Morning America, INC.com, Entrepreneur Magazine, Forbes and more. YEA! graduates have also been awarded millions of dollars in college scholarships, millions in VC funding, and have gone on to graduate from the best business schools in the world. The YEA! Finger Lake Community College and Cayuga Community College Application Deadline is October 12, 2018. Classes will meet one time per week beginning late October and graduating in early June. Classes take place at Cayuga Community College Wednesday’s from 4-7 pm and at Finger Lakes Community College on Saturday’s from 9-12 pm. Students in grades 6-12 are eligible to apply to either location. Since 2004, over 9,000 students between the ages of 11 and 18 have launched more than 6,000 real businesses and non-profits, cool inventions, and fun ideas! YEA! students have been featured in national magazines, TV shows, on the news and in the local papers. For more information, visit here. Thank you for your support of our mission. Let’s teach every kid in America how to “make a job” not just take a job, and that success is synonymous with freedom.